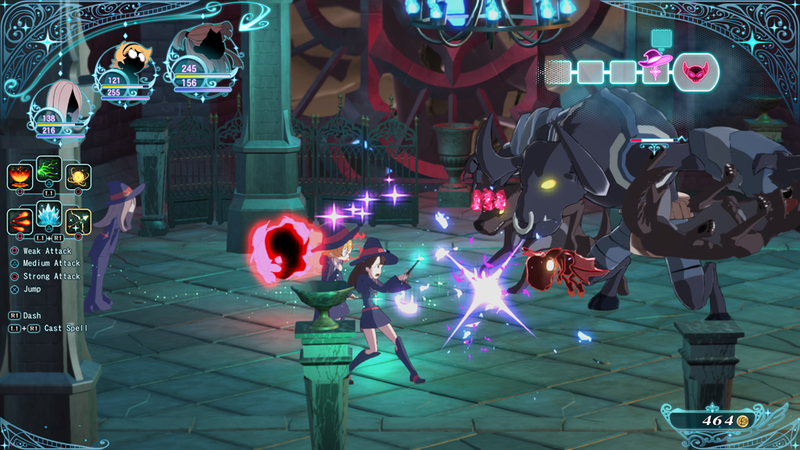 Little Witch Academia: Chamber of Time is a RPG/Beat ‘em up developed by A+ Games and published by Bandai Namco. The game is a tie-in with the anime bearing the same name. 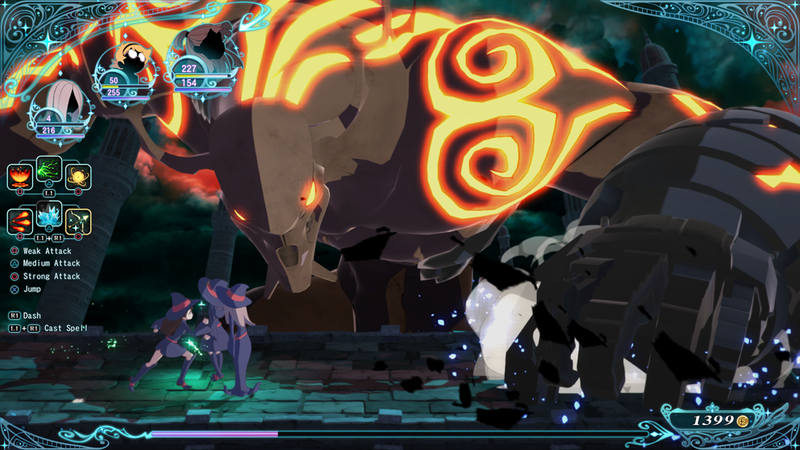 To put things gently, Little Witch Academia: Chamber of Time is a game that tries to stretch out as little content as possible for as long as it can. If you look at this game as a piece of fanservice, then there’s things to like here. The game looks fantastic, and every single line of dialogue is voiced. If you like these characters, you’ll definitely appreciate that. However if you look at this game purely as the weird beat ‘em up RPG it tries to be, it falls apart pretty quickly. The premise of the story is that it’s summer vacation at the school. 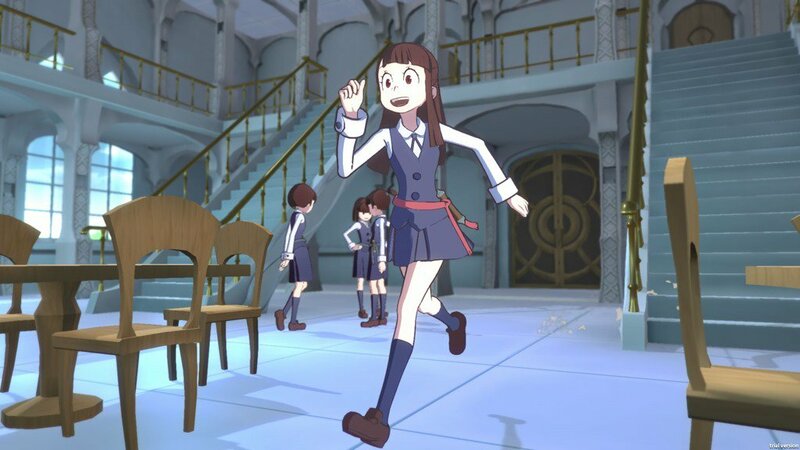 The protagonist Akko must clean and organize the library as a form of punishment. She eventually discovers a hidden room in the library, and stumbles on a magic clock. 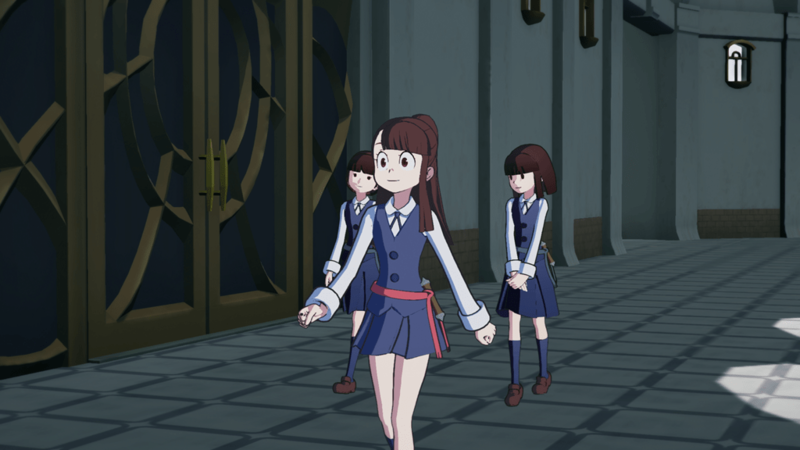 Some things happen, and now everyone except Akko and her closest friends are doomed to repeat the same day over and over again. Thus begins their quest to try to undo the curse they find themselves in. There are basically two segments to this game, running around the school, and fighting in dungeons. The former is where you’ll be interacting with all the characters from the show as well as doing quests. The latter is where gameplay happens. It might be weird to say, but the gameplay feels completely tacked on. It really holds no relevance to the narrative, it’s basically just something to do. Sometimes you need certain items for a quest, and you’ll probably find them in dungeons. You’ll be bouncing back and forth between these two segments as the game progresses. The biggest issue with the running around the school parts is that it feels designed to waste your time and for things to be as drawn out as possible. First, there is a constant timer in the game as you proceed through this groundhog day scenario. Different things happen at different times of the day. If it’s currently in the evening, and you need to go to some place in the morning, you have two options. Wait until the day resets itself, or take a nap to make time go by faster. To take a nap, you have to go to your room. Luckily, there’s fast travel. Unluckily, using fast travel requires a consumable item. You can also only warp between save points, and activating save points also requires a consumable item. These items can only be obtained by exploring dungeons. The amount of repetitive tasks and running around you have to do in the school can be pretty tiring. Doing quests often requires talking to several different people, and at different times for each person. So just getting the right information to start you on your quest can require multiple trips of running to your room to speed up time and resetting the day. It feels specifically engineered so that the most trivial of tasks take as long as possible. The dungeon exploring aspect of the game is perhaps worse. It plays like a beat ‘em up, and not a very good one. You have light, normal, and heavy attacks, and can equip up to 6 magic spells at once. Each character has their own quirks and sometimes unique mechanics, like a shield instead of dodge roll, but there’s not too much that differentiates them. You can just play as your favorite if you so chose, though Akko is still the lead character of course. I found the movement to be both sluggish and slippery. Combine this with some characters pitifully short attack ranges, and it can be frustrating to just walk up to an enemy and attack them. Hit detection also leaves something to be desired, as if you’re not on exactly the right plane that the enemy is, your attacks will just whiff completely. To make a rather questionable system worse, you have AI partners with you at all times that do little more than make it hard to keep track of your own character. Enemies also have very, very poor telegraphs on their attacks, so with all of that going on, good luck actually evading enemy attacks. Boss fights are slightly better in that regard, but they’re also just not very fun to fight. I found that I could very easily spam heavy attacks at them and take them out without much challenge. On top of not being very fun, the dungeons also feel entirely pointless. They don’t really have anything to do with the narrative at all, aside from occasionally needing some loot from them. This game just doesn’t really have anything for anyone, I feel. If you like the show, yeah there’s some character interactions, but even with me being unfamiliar with the source material, it sounded pretty phoned in. No events from the anime are in this game, even though one of the bullet points for the game is you can experience the anime. It’s an original story, but the story is just entirely uninteresting. Couple that with frustrating gameplay, and this wasn’t a pleasant experience. 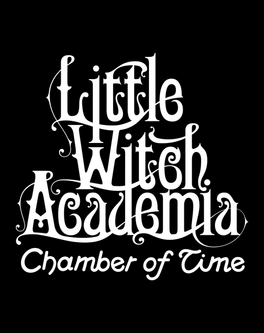 The best thing I can say about Little Witch Academia: Chamber of Time is the good production value. Visually, the game looks very nice. Every line of dialogue is voiced. There are even short animated cutscenes every now and then. But this is all surface stuff. Dive into the game, and it becomes apparent very quickly that most of the focus on the game was just making it look good. It’s a game that barely manages to hold your attention for several hours stretched to almost 30. At a $60 price tag, I’d give this game a hard pass.